In Feb. of 2011, I published a post titled What is Transformation Northfield’s public agenda? that detailed my concerns about the local public officials who were involved with the group. Two of the local political leaders I featured in that piece were At-large Northfield City Councilor Rhonda Pownell and Northfield School board member Jeff Quinnell. Rhonda is running for mayor of Northfield; if she loses, she’ll retain her At-Large seat. Jeff has decided to not run again for the School Board and instead, is running for Rice County Commissioner, District 2. New on the local political scene is Dan Cupersmith who’s running for Northfield School Board. Dan is a member of Transformation Northfield and Rejoice! Church. I spoke with Rhonda after one of the election forums at the Cow and told her that while I was initially concerned about her connection to Transformation Northfield (TN) and Rejoice!, I was no longer worried. Yes, she abstained on the marriage amendment vote and was the only council member to vote against the domestic partner registry ordinance this summer and I disagree with her on those issues. But those votes in my mind have been outweighed by her overall performance as a councilor and to my knowledge, she’s never spoken or acted in a way that would convey she believes God or Pastor Dan Clites are telling her what’s best for Northfield. Am I voting for Rhonda or Dana Graham for mayor? I’m still undecided. I haven’t followed the School Board very closely in the past four years and I have no specifics, pro or con, to say about Jeff’s performance. So Jeff is still a concern to me. I’ll be voting for Galen Malecha. This is starting with the youth. One of the examples/testimonies that we saw was Valley Christian School in California, a school that was really on the down and out [garbled] and possibly being closed and now has turned around to be one of the top schools in the nation and it was all led through prayer evangelism. That may not seem like much but it’s worrisome to me, especially when you hear Brett Reese predicting that "Northfield will become a city of God" and Dan Clites proclaiming, "If you really want to change the world, you have to change the marketplace. You gotta change the atmosphere of the government, you gotta change the atmosphere of the education system…"
I will not be voting for Dan Cupersmith for Northfield School Board. I will be voting for Rob Hardy, Ellen Iverson, and Anne Maple. It’s one month till the election and the race for Northfield School Board is between Dan Cupersmith, Rob Hardy, Ellen Iverson, Anne Maple, and Noel Stratmoen (top four vote-getters will serve). 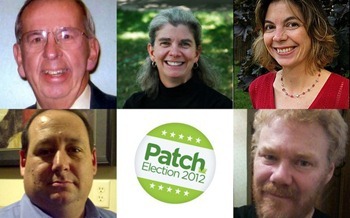 Patch has compiled basic biographical information about this year’s five school board candidates. Click on their names for more information.